CBS finished in first place for the evening with 6.34 million viewers, but was tied for second place among adults 18-49 with a 1.3/5 rating/share. 8:00 p.m.: A repeat of Ghost Whisperer (5.45M viewers, 1.1/5 A18-49 rating/share). 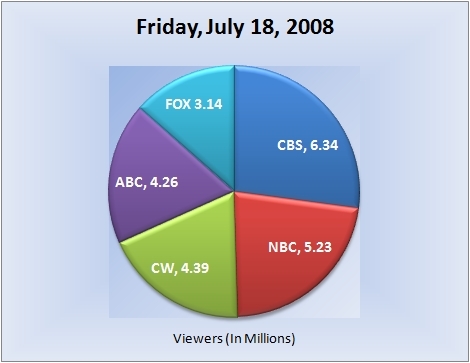 9:00 p.m.: A repeat of Numb3rs (6.46M viewers, 1.4/5 A18-49 rating/share). 10:00 p.m.: Week two of Flashpoint (7.11M viewers, 1.5/6 A18-49 rating/share). NBC followed in second place for the evening with 5.23 million viewers, but fell to a fourth place tie among adults 18-49 with a 1.2/5 rating/share. 8:00 p.m.: A repeat of Most Outrageous Moments (4.36M viewers, 1.1/5 A18-49 rating/share). 8:30 p.m.: Another repeat of Most Outrageous Moments (4.12M viewers, 1.0/4 A18-49 rating/share). 9:00 p.m.: Dateline NBC (5.73M viewers, 1.3/5 A18-49 rating/share). The CW finished in third place for the evening with 4.39 million viewers, but managed a first place finish among adults 18-49 with a 1.6/6 rating/share. 8:00 p.m.: Friday Night Smackdown! (4.39M viewers, 1.6/6 A18-49 rating). ABC followed in fourth place for the evening with 4.26 million viewers, but managed a second place tie among adults 18-49 with a 1.3/5 rating/share. 8:00 p.m.: A repeat of America’s Funniest Home Videos (4.84M viewers, 1.4/6 A18-49 rating/share). 9:00 p.m.: Duel (3.31M viewers, 0.9/4 A18-49 rating/share). 10:00 p.m.: 20/20 (4.64M viewers, 1.5/6 A18-49 rating/share). FOX finished in fifth place for the evening with 3.14 million viewers, but managed a fourth place tie among adults 18-49 with a 1.2/5 rating/share. 8:00 p.m.: A repeat of the film The Animal (3.14M viewers, 1.2/5 A18-49 rating/share). Note: Network average numbers from the week prior are based on fast national data. Comparison’s from the week prior (or episode-to-episode, etc.) on specific shows are based on final national data. Ratings for the current day are based on fast nationals. (Expect all three scenarios to be the case at all times, unless otherwise noted). The final rating for first-run episodes that aired this evening will be reported the following week. So for example, the final rating for tonight’s episode of “Flashpoint” will be reported in next weeks report for Friday, July 25, 2008. Also keep in mind that because these are fast national ratings, numbers may increase or decrease when the final nationals are released.